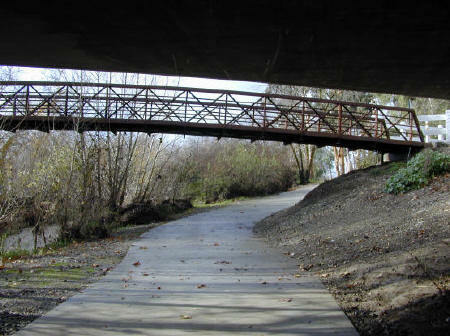 The Isabel trail runs along the new section of Isabel Ave, from Jack London Blvd near the airport to Alden Lane, where it turns east and runs between the quarry area the the Oaks housing development. 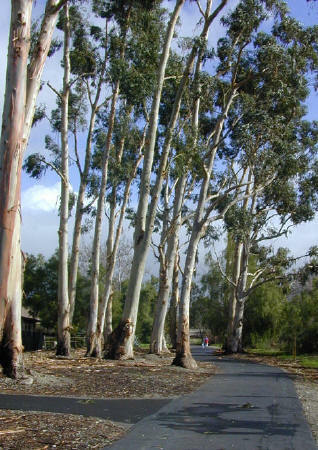 It is a multi-use trail, for bicycling, walking, and horseback riding. The intersections at Concannon Blvd and Jack London have "pedestrian" buttons up high for those on horses. Most of the trail is separated from the Isabel Ave traffic making it a good trail for children. Isabel also has bike lanes on the road itself. The Arroyo Mocho trail runs from the Isabel trail to Almond Ave. School. From the west end it travels through a housing development, running along the original path of the Arroyo Mocho, which has since been rerouted to run along Stanley Blvd. 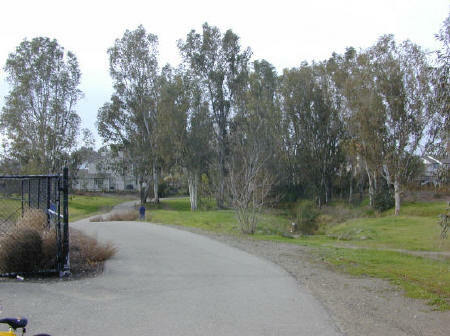 When exiting the housing development the trail meets back up with the the present Arroyo Mocho. It then goes under the railroad tracks, under the old SP railroad bridge that is no longer used (see pictures), then under Stanley Blvd. From here is goes behind Granada High School and Mocho Park, and under Holmes street. 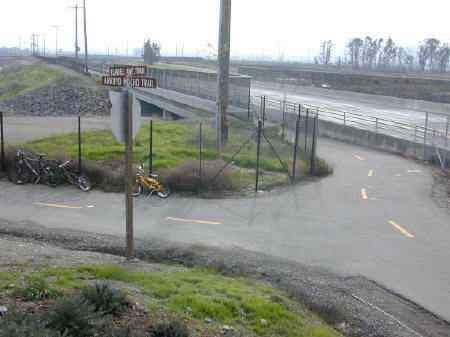 It then proceeds under L Street, and through Robertson Park, where it crosses the Arroyo Mocho on bridges a few times. It crosses Livermore Ave. at the old Ferrario winery building (aka Mayflower building) and the Retzlaff Winery, then heads north for a bit behind city hall and near the skateboard park, heading through another residential area to Almond Ave school. The whole path is about 5 miles. Arroyo Mocho and Isabel Trail intersection. The bridge is Isabel Ave as it passes over the Arroyo Mocho. Arroyo Mocho trail near the railroad bridges. Looking west toward a housing area. Arroyo Mocho trail from under the Arroyo Road bridge, looking west toward the pedestrian bridge. Arroyo Mocho trail in Robertson Park, looking west. 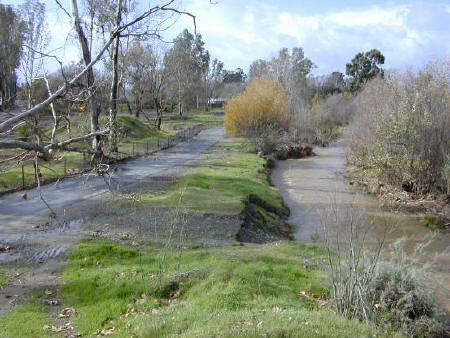 The Arroyo Mocho is on the right. Arroyo Mocho trail west of Arroyo Road, looking east. The path going to the left leads to a street in the housing area immediately to the left..